""You were a fantastic host and we had so many compliments about the food! It was a brilliant day and went so smoothly where possible so a huge thank you for that. I really appreciated all the special things you included in the menu for Alan and also me! I got spoilt rotten! " "The comments I've received have been overwhelming. The series seems to have hit a good vibe and has captured the participants and press' imagination. 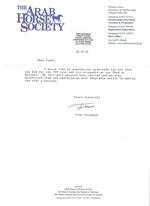 In terms of your service the response was fantastic. Every single driver and team manager who left the awning after lunch said to me words along the lines of 'great food', 'fantastic', 'wonderful' with comments such as 'The best food I've ever had at a motor racing event' coming from someone who regularly works at the Goodwood Festival of Speed and dines on the top table! What can I say, other than I'm really looking forward to the next round primarily because I want some more yummy food. " "Super Food, Super Service, Super Team and so good to work with"
"Very welcoming and friendly, lovely food. Have had a fantastic day. Thank you"
"Completely delicious food- thank you & for a warm welcome. The Best"
"We most definitely found the right partner to provide our catering needs. You and your team provided a first class service for us. Thank you." "My experience of Candy Watson is one of professionalism and excellent service. Having Candy cater an event begins with a personal visit to discuss all aspects of the event, from the menu, wines and flowers to the location layout, service and ambience. A process of development quickly follows around ideas presented by Candy until we are both satisfied that we share the same view of what is required. Candy’s ideas are informed by her extensive experience of what works in practice, for the numbers she is catering for, and within budgetary constraints. Her menus are drawn from an international cuisine repertoire and she uses only fresh quality ingredients. Finally, she delivers what she promises. I can only highly recommend Candy and would not hesitate to ask her to work with me again." "Please be advised that Candy Watson has been know to me for approximately 6 years and has catered for our events for 5 years. Candy’s company has catered for our events in a professional and reliable manner and nothing has been too much trouble. Her food is always first class and we now trust her implicitly to provide our staff and sponsors with meals that are imaginative, wholesome and professionally presented. Candy is a valued member of our contracting team and her ability to work under pressure and work within our parameters has enabled us to concentrate on our events without any cause for concern. I trust that the information above is sufficient, but should you require any further information please do not hesitate to contact me on 01327 262256." "I would like to express our gratitude for all that you did for the VIP tent and its occupants at our Show in Malven. We very much enjoyed your cuisine and we also benefited from and appreciated the adaptable skills in making the tent a success." "Thank you so much for the beautiful wedding, it was perfect. 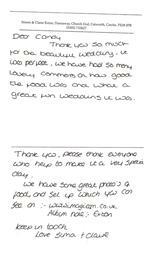 We have had so many lovely comments on how good the food was and what a great fun wedding it was. Thank you, please thank everyone who helped to make it a very special day." "Firstly, a big thank you to you and your team for providing such fantastic hot and cold running food over the weekend of Broadway Horse Trials. We have had so many compliments about your catering from the bacon rolls through to the home-made cake! As we agreed, please put the weekend of 14th & 15th October in your diary. Again, we will have to work on sponsorship and so will liase with you nearer the date. Again, very many thanks. Have a good summer." 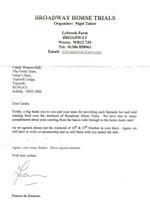 "Just a short note to say thank you once again for the standard of catering at the Horse Trials. All of the guests and the officials were impressed by the quality of the food provided. Please also thank your mother and her team for the lovely flowers in the marquees. We are already looking ahead to 2009, and hoping to build Barbury even bigger and better. 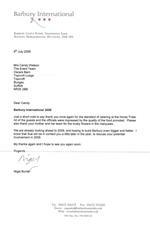 I know that Sue will be in contact with you a little later in the year, to discuss your potential involvement in 2009. My thanks again and I hope to see you again soon."